When planning a residential or commercial move in Stanislaus County, CA, you need to work with an experienced crew of Modesto movers to ensure that your relocation is a seamless, hassle-free process. Since 1891, Mid Cal Moving & Storage has offered comprehensive support for relocations of all sizes, and our team has the skills, experience, and industry knowledge to handle moves within the area and around the world. Full-service packing and fragile-only services. Custom crating for high-value, large items. Protection of doorways and floors. 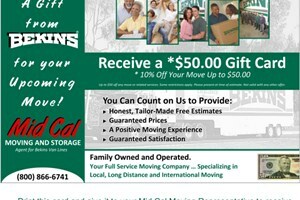 Mid Cal is proud of our reputation for excellence within the industry, and as a BBB-accredited, ProMover-certified Mid Cal moving company, we deliver timely, personalized support with every project we take on. Not only are we fully equipped with state-of-the-art resources to handle an impressive scope of household and business moving needs, but as a Bekins Van Lines agent, we are part of a global network of moving experts that are committed to your satisfaction. Residential Moving: Planning a household move is a big undertaking, but we take care of all of the details to eliminate the stress and hassle of the process. Commercial Moving: Keep your business move on-schedule and on-budget with the professional support of our experienced Modesto movers. International Moving: When planning a relocation overseas, we provide solutions that coordinate every aspect of your move—down to the smallest details. Specialized Moving: If you need to relocate high-value, fragile, and oversized items as part of your move, you can trust that we have the skills to ensure safe delivery. Storage Services: Our short- and long-term storage solutions are designed to protect all of your personal and business items for as long as needed—at an affordable price. Learn More About Planning Your Move With Our Stanislaus County Moving Company! When choosing a team of Modesto movers to handle the details of your upcoming relocation, you won’t find better service, quality, and value than with the pros at Mid Cal Moving & Storage. To learn more about how our Stanislaus County moving company can create a customized relocation plan for you, just give us a call today! You can also get set up with an appointment for your free estimate and no-obligation consultation by filling out our online form now.